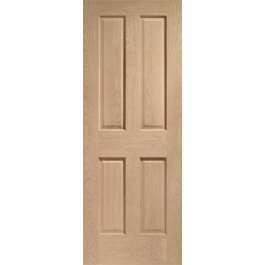 44mm flush FD30 fire rated internal oak veneered door with 4 flush panels and inset beadings. Supplied factory finished in clear satin lacquer. Available in standard imperial sizes with 10 years manufacturing guarantee. Traditional classic style Victorian 4 panel oak fire door with non-raised mouldings, prefinished in clear lacquer.